PYO $100 Bill Winners, Week 5! As a part of our ongoing 100th Anniversary Celebration, we’ve been stashing $100 bills in random Pick-Your-Own bags. This past weekend saw many friendly faces and new visitors for our 7th Annual Tractor Plow day, Storybook Hayrides, and, of course, Pick-Your-Own pumpkins and apples! 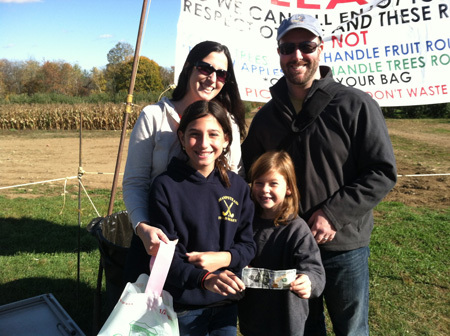 This family of apple pickers from Kingston, NH, found a $100 bill bonus in their ½- bushel bag! We hope to see you all this weekend for our final Fall Harvest Festival weekend of 2013!